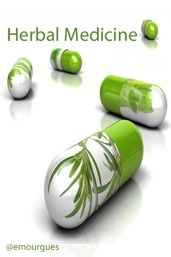 Phytotherapy is the study of the use of extracts from natural origin as medicines or health-promoting agents. Traditional phytotherapy is often used as synonym for herbalism and regarded as « alternative medicine » by much of Western medicine. Modern phytotherapy when critically conducted, can be considered the scientific study on the effects and clinical use of herbal medicines. 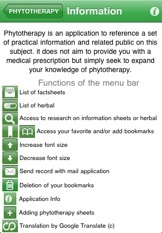 This dictionary provides an introduction to the terms of phytotherapy. He did not aim to treat you or give you a prescription but simply to broaden your knowledge base on this subject. Ergonomics full functionality and use of the Iphone. Fast in its grip and its use. 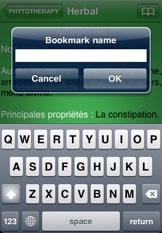 – quickly create favorite reading. – quick and complete search functionnality. 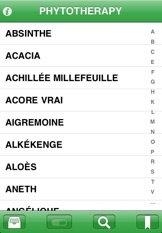 Search from words but also intuitive search from characters (intuitive search) plus case sensitive. -Connection with the E-Mail application, sending of the dictionary content by email. 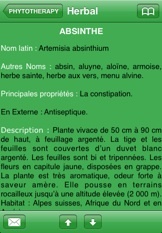 – the main plants and active ingredients listed (currently). – instant access on line and off line. – The ability to create its own « Favorites » to instantly access.